(Nanowerk News) Engineers at the University of California San Diego have developed a breakthrough in electrolyte chemistry that enables lithium batteries to run at temperatures as low as -60 degrees Celsius with excellent performance -- in comparison, today's lithium-ion batteries stop working at -20 degrees Celsius. The new electrolytes also enable electrochemical capacitors to run as low as -80 degrees Celsius -- their current low temperature limit is -40 degrees Celsius. While the technology enables extreme low temperature operation, high performance at room temperature is still maintained. The new electrolyte chemistry could also increase the energy density and improve the safety of lithium batteries and electrochemical capacitors. The work has been published online by the journal Science ("Liquefied Gas Electrolytes for Electrochemical Energy Storage Devices"). The technology could allow electric vehicles in cold climates to travel farther on a single charge, alleviating range anxiety during the winter in places like Boston. The technology could also be used to power craft in the extreme cold, such as high atmosphere WiFi drones and weather balloons, satellites, interplanetary rovers and other aerospace applications. 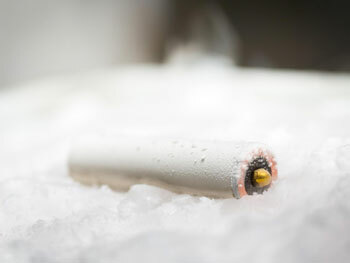 The batteries and electrochemical capacitors the researchers developed are especially cold hardy because their electrolytes are made from liquefied gas solvents -- gases that are liquefied under moderate pressures -- which are far more resistant to freezing than standard liquid electrolytes. The new lithium battery electrolyte was made using liquefied fluoromethane gas. The electrochemical capacitor electrolyte was made using liquefied difluoromethane gas. "Deep de-carbonization hinges on the breakthroughs in energy storage technologies. Better batteries are needed to make electric cars with improved performance-to-cost ratios. And once the temperature range for batteries, ultra-capacitors and their hybrids is widened, these electrochemical energy storage technologies can be adopted in many more emerging markets. This work shows a promising pathway and I think the success of this unconventional approach can inspire more scientists and researchers to explore the unknown territories in this research area," said Shirley Meng, a nanoengineering professor at the UC San Diego Jacobs School of Engineering and the study's senior author. Meng leads the Laboratory for Energy Storage and Conversion and is the director of the Sustainable Power and Energy Center, both at UC San Diego. "It is generally agreed upon that the electrolyte is the primary bottleneck to improve performance for next generation energy storage devices," said Cyrus Rustomji, a postdoctoral researcher in Meng's group and the study's first author. "Liquid-based electrolytes have been thoroughly researched and many are now turning their focus to solid state electrolytes. We have taken the opposite, albeit risky, approach and explored the use of gas based electrolytes." The UC San Diego researchers are the first to explore gas-based electrolytes for electrochemical energy storage devices. In the future, this technology could be used to power spacecraft for interplanetary exploration. "Mars rovers have a low temperature specification that most existing batteries cannot meet. Our new battery technology can meet these specs without adding expensive and heavy heating elements," Rustomji said. In pursuing this project, the UC San Diego team realized that gases have a property that would make them work particularly well at temperatures where conventional liquid electrolytes would freeze -- low viscosity. "Low viscosity leads to high ion mobility, which means high conductivity for the battery or capacitor, even in the extreme cold," Rustomji said. The team explored a range of potential gas candidates but focused on two new electrolytes: one based on liquefied fluoromethane (for lithium batteries) and the other based on liquefied difluoromethane (for electrochemical capacitors). In addition to their exceptional low temperature performance, these electrolytes offer a unique safety advantage. They mitigate a problem called thermal runaway, which is when the battery gets hot enough to set off a dangerous chain of chemical reactions that in turn heat up the battery even further. With these new electrolytes, the battery will be unable to self-heat at temperatures much higher than room temperature. That's because at high temperatures, these electrolytes lose the ability to dissolve salts, so the battery loses conductivity and stops working. "This is a natural shutdown mechanism that prevents the battery from overheating," Rustomji said. Another nice feature, he noted, is that this mechanism is reversible. "As soon as the battery gets too hot, it shuts down. But as it cools back down, it starts working again. That's uncommon in conventional batteries." Further, Rustomji said, under more severe conditions such as an automobile accident when the battery is crushed and shorted, the electrolyte gas may vent away from the cell and, due to the lack of electrolyte conductivity, prevent the thermal runaway reaction which would otherwise be difficult to avoid with conventional liquid electrolytes. Meng, Rustomji and colleagues have made a big step forward towards accomplishing another long-sought dream of battery researchers: making an electrolyte that works well with the lithium metal anode. Lithium is considered the ultimate anode material because it can store more charge than existing anodes and is lighter. A problem is that lithium metal reacts with conventional liquid electrolytes. These chemical reactions cause lithium metal to have a low Coulombic efficiency, meaning it can only undergo a limited number of charge and discharge cycles before the battery stops working. Another problem using conventional liquid electrolytes with a lithium metal anode is that with repeated charge and discharge cycles, lithium can pile up at particular spots on the electrode. This causes the growth of needle-like structures called dendrites that can pierce parts of the battery, causing it to short-circuit. Previous approached to improve these issues include: using low viscosity electrolytes; applying high mechanical pressure on the electrode; and using what are called fluorinated electrolyte additives to form an ideal chemical makeup on the surface of the lithium metal electrode. The new liquefied gas electrolytes developed by the UC San Diego team combine all three of these key aspects into a single electrolyte system. The subsequent interphase formed on the electrode is a highly uniform and dendrite free surface allowing for a high Coulombic efficiency of over 97 percent and improved battery conductivity. This is also the first time an electrolyte has been shown to have high performance on both lithium metal and classical cathode materials, which could allow for a substantial increase in the overall energy density of batteries, researchers said. Moving forward, researchers aim to improve the energy density and cyclability of both batteries and electrochemical capacitors and to run at even lower temperatures -- down to -100 degrees Celsius. This work could lead to the development of new technology to power spacecraft sent to explore the outer planets such as Jupiter and Saturn. Rustomji is leading a UC San Diego-based team working to commercialize this technology via a startup called South 8 Technologies.